Despite its rural 18th-century setting, the themes of sexual bigotry and violent repression which play out in Baltazar’s dark music video Lluvia are unfortunately all too relevant across the globe today. Illustrating the many hands which go into accomplishing an ambitious and socially relevant project such as this, DN hands things over to Unlimited Films, the team behind Lluvia, who share their respective production vantage points of this visceral film about the intolerant destruction of real love. I was a bit sceptical at the beginning because honestly, I wasn’t very familiar with the band but after our first meeting when they presented us with the track Lluvia fell in love with it. What really caught my attention was that it wasn’t a conventional music video with playback and all the usual settings, it was a video with the power to transmit an idea and a message with a more cinematographic approach. I believe in the importance of telling a story especially if it contains a message that involves all of us and talks about a society with no discrimination. The biggest challenge was to pull this through because we had a limited budget, but with the support of the whole crew and their commitment, it was possible. I worked very closely with Director Jorge G. Camarena in creating the universe for Baltazar’s Lluvia which involved a lot of planning, some very complicated locations and night shoots which are always difficult. One of the most important things for me is to create a positive working environment where the ideas from everyone are heard and considered because that is what ultimately makes a project work and helps tell the story in the best possible way. So it was always a collaborative environment, especially between the director, cinematographer and production design departments. We believe in the importance of always transmitting a message, this time we do it with our hearts in our hands, with a theme that involves us all. We shot in a little town near Guadalajara (our hometown) called Juanacatlan, where we found the locations that we needed but the access was complicated because they were located in the middle of the forest with no basic services nor roads. The weather was also a challenge because it was partly raining and it was very cold at night but with the help of my production team we managed to create the necessary logistics so that it was possible to shoot there. This is the most complicated project that I have worked on in my career as a producer. We obviously had some rough challenges in all of the stages of production, but I took it as a personal challenge because I believe that the only way to grow as a professional is to push yourself and get out of our comfort zone. I think that every obstacle I had during this project became a learning experience and even though it was rough I think that we managed to create something that I am really proud of. I was approached by Juan Pablo Corcuera (vocals and guitar) and Manager Anonimos (Baltazar MNGMT team) with the commission to create a music video to the track Lluvia. I was really intrigued because Juan Pablo, Luis and Robin (Baltazar) explained the whole concept of the band to me, what was behind the lyrics, the live shows and the upcoming albums. They really have a conceptual structure with a very detailed explanation of what the band is, what they want to tell and what they believe in. So we started to have creative meetings to establish the basic story of Lluvia, what we wanted to portray and say. When I heard the track I thought it had a dark vibe mixed with a nostalgic feeling so I thought it made a good candidate for a love story. From the beginning, we agreed to make a short story and not a traditional playback video because we were more interested in portraying the music along with images that support the feelings and ideas that we wanted to transmit. People in the modern age with a different sexual orientation are sometimes still treated as witches. We live in Guadalajara Jalisco Mexico, which is one of the biggest cities in the country but it is also one of the most conservative cities in Mexico. I thought it was interesting working on the premise that our main characters lived back in the 18th century and were sentenced to death with the pretext of witchcraft because people didn’t accept their sexual orientation, they thought it was the devil inside them that made them behave that way. So the treatment became a love story set in the 18th century to create a parallelism between the beliefs of those times and social structure to the beliefs our modern society so that maybe we can create our own conclusions on how little we have evolved and how people in the modern age with a different sexual orientation are sometimes still treated as witches. I worked very closely with Gerardo Guerra (Cinematographer) because I admire him a lot and take his point of view very seriously, he has a unique way to portray story and is always searching for the perfect way to merge beautiful images with meaning and narrative. Marisol, our Producer, makes sure that we are all collaborating together to make the best video possible, joining the creative conversations by giving us her ideas and notes on the story. She is very talented and pushes us to give our best. Alex Arbesu Norton our Production Designer has a very specific eye for the narrative, he doesn’t put anything on set that doesn’t support the story and is always very attached to the script, giving me notes and points of view (which I take very seriously) of what he believes could be better. 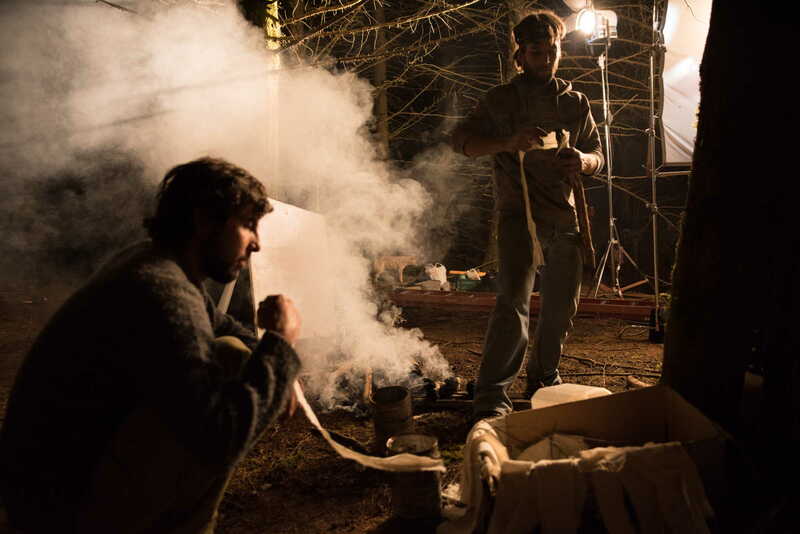 Lluvia was a very complex project, it combined period film aesthetic, violence, fire, animals, night shooting, poor road access to locations and a tiny budget. The 1800s cart was extremely difficult to transport because it was practically falling apart and it weights near 1 ton, yet it needed to roll. 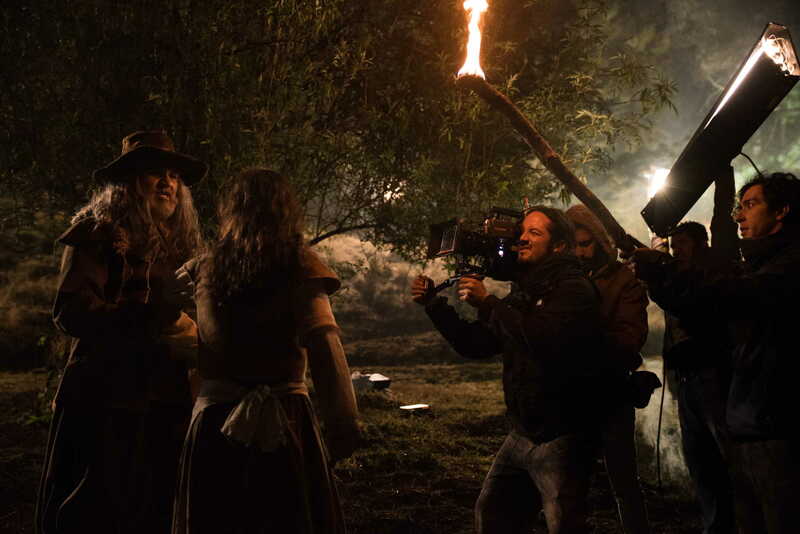 Some of the hills and woods we shot were hard for the mules (and the naked characters on the cart) but we managed to get it going for the scenes, and no one nor animals were hurt. The village was a particularly elaborated location. It was abandoned, and grass rose higher than our knees. We built pretty much everything but the wood structure; we re-roofed both huts, cut the grass everywhere, put in chimneys, took out many pounds of cardboard that were on the walls to keep the cold out, took out tons of garbage and destroyed furniture, etc. Everything in less than 2 days. It is amazing how violent a hanging is, even when you know it is all fake and safe. While the art crew prepared this location, we discovered many animals that were already living in the huts like bats, rats, many spiders and several hives of huge wasps that continuously attacked us for hours, stinging me in both arms and stinging an assistant on the lip. However, we were working against the clock and dawn, so we couldn’t stop. It’s not as present in the video but it was very important to create the feeling that there were at least two huts so the feeling was not of isolation. We are lucky to live in a country where people still trust strangers and lent us their amazing pets and animals: geese, chicken, mules, sheep, dogs, etc., all from neighboring farms. Even though it’s mostly shot at night, we needed to have animals and crops present to have a realistic self-sufficient community ambience. 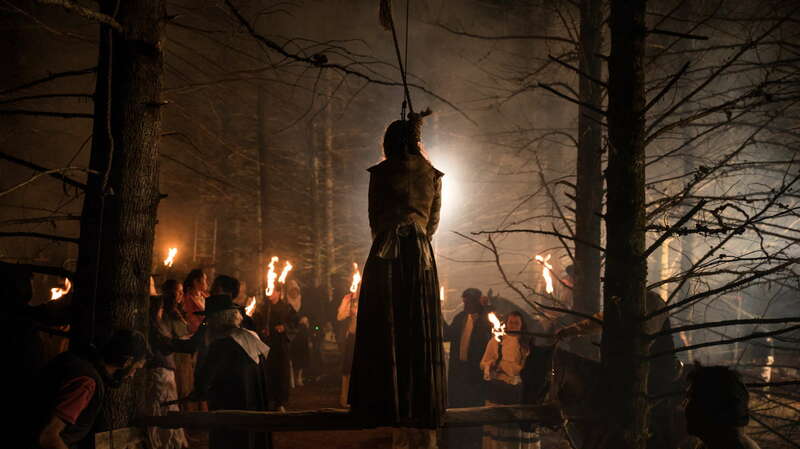 In the hanging scene, we had to portray a very measured and safe version of a New England gallows, it needed to seem small but not improvised. It is amazing how violent a hanging is, even when you know it is all fake and safe. People’s faces quickly cringed every time the stand was dropped. Having dead body dummies around was fun, but when we had them in place on set it makes you think how throwing bodies in holes and burning them is something that still happens every day in our country and how horribly normalized it’s becoming. When starting out the collaboration with the band I think we all wanted to do something completely different. I can’t remember exactly who came up with the idea of the couple and this concept of portraying society in a very rudimentary way, but Jorge definitely materialized it in the concept script. We really didn’t have much money for the whole piece, so by trying to shoot a period kind of video, production design, wardrobe and makeup was naturally a challenge. I remember looking at the first scene in daylight while waiting for the sun to go down and realising we could have never shot the wardrobe in the day, the whole thing needed to be by night in order for it to work; we just didn’t quite have the budget to make the wardrobe in the quality that it would have required for day shooting. We did want a very energetic camera for the scene in the hut when the father walks in on the girls. Although nearly the whole thing was shot on a gimbal, we did use handheld for those tense moments where the audience needed to be immersed in their stress, in their situation and breakage. That scene, in particular, seemed a bit over the top in the way we were approaching it, but being an MOS scene, the bit over the top actually ended up helping a lot, at least that’s what I believe. It sort of gave the whole thing more physicality to it. For a music video, I believe this was a very ambitious little project. There were so many things that could go wrong. Horses, dogs, sheep, ducks, kids, smoke, snow… not to mention fire. Most of the extras were not even extras, nor had they ever been on a film set, most of them lived nearby in a very humble little town close to Tapalpa, Jalisco. For the hanging scene, instead of shooting wide and going close, we prioritized the shots in which we actually needed lots of people in them to work, so we took it from there. Controlling the whole thing was a great feat by the AD Alejandro Álvarez and the production team lead by Marisol. Both doing an amazing job given the circumstances. The location where the two girls kiss was downhill from a road where basecamp was set. It was a very steep and hard to get to the location, you had to go around a small pathway that would take you down to set. The staff had to set up a pulley to get the equipment down. Lights to create the moonlight on the set would have been set on the top of the hill, but we just didn’t quite have the punch that we needed to light the whole thing from the top. So the gaffer and his team had to set up lights in the middle of the steep hill to create a sort of general moonlight on the set. It was indeed a challenge for everyone to get down there, especially for the technical and camera crew. It really was a very intimate and great setting to work that beautiful scene. Jorge and I would constantly tell each other that we should have shot this with acting and sound and all that… It would have been great but I´m kind of glad that we didn’t, it was just the right tempo. It kind of speaks a bit about the band being called very cinematic and their music having a bit of that feel with the images in the mood of the song. I think Lluvia doesn’t precisely touch the theme of the video, some might disagree on that, but it indeed has the mood of the images that we shot though. There were so many things that could go wrong. Horses, dogs, sheep, ducks, kids, smoke, snow… not to mention fire. The world of Lluvia would not have been possible if it were not for the amazing work of very passionate and talented people. Everyone involved was very much in tune with what we were doing. The Production Design that Alex and his team put into the piece was pure passion. Without it, this Baltazar world would not exist. The detail of live animals and carefully placed props gave it a special touch that made you believe the world. We shot on Arri Alexa Mini at 4K 4:4:4 with Cooke mini s4i lenses, Mitchel A and FOG filters and controlled focus and iris with WCU-4 unit and cforce motors. This sweet setup gave us the kind of freedom we needed to move the camera around however we wanted. We shot almost 80% of the film with the camera on the Ronin. The Ronin seems light, but it´s heavy as hell, to me at least. It´s a nice and smooth ride but I think you have to be careful, it can get to feel a bit motorised if you abuse pans and whip pans too aggressively. Stabilization is superb, don’t get me wrong, it´s an amazing tool… but it can feel mechanic if you make quick movements when adjusting frame, there´s also a lack of organic to it that can feel wrong for certain things. It can also limit the physical control that you have on the frame, those minor adjustments that you can quietly and very subtly make when you have the camera directly in your hands. We shot with Tungsten sources for a silver moonlight color. Even the few HMIs that we used for the backgrounds, an M90 and a couple of M18s we corrected for tungsten. The rest of the general moonlight that would actually hit the set was an array of mini brutes lined the right way from far away to get an even exposure on the set. We might have gone a bit too lit in some shots, nothing that would give us too many problems. The end result was a very contrasty moody kind of setting and working with Joe Castañeda my go to DIT and Colorist in making a LUT that could resemble what we wanted was so helpful. It´s so nice to be able to watch a shot on camera very close to what you want and also being able to watch it a couple of minutes after you shot it in the computer, realising you didn’t mess up and having someone give you input on it is indeed very valuable. First of all, I wanted to be part of this production because of the story, I strongly believe this music video breaks barriers in each scene. I worked with a spectacular team so talented, the director tried to be very careful in each scene. The character that I developed taught me that love is free and needs to be respected in any era, in any person. I truly felt Judith’s pain when she was being separated by Maria’s father because he was nothing to do with their relationship. I can’t imagine how many people died in a similar way, that’s why I decided to be part of this, to reflect that we still have the old mentality of humanity. The character that I developed taught me that love is free and needs to be respected in any era, in any person. I am so excited to be part of this project because what Baltazar show in this film is that no matter what era we live in, we need to respect, to let people love whoever they decide to love. Love is love and that’s it.